The idea of making Aurora Borealis lampwork glass beads during this year came along as a result of building anticipation that 2013 is a "peak" year in the aurora 11 year cycle. 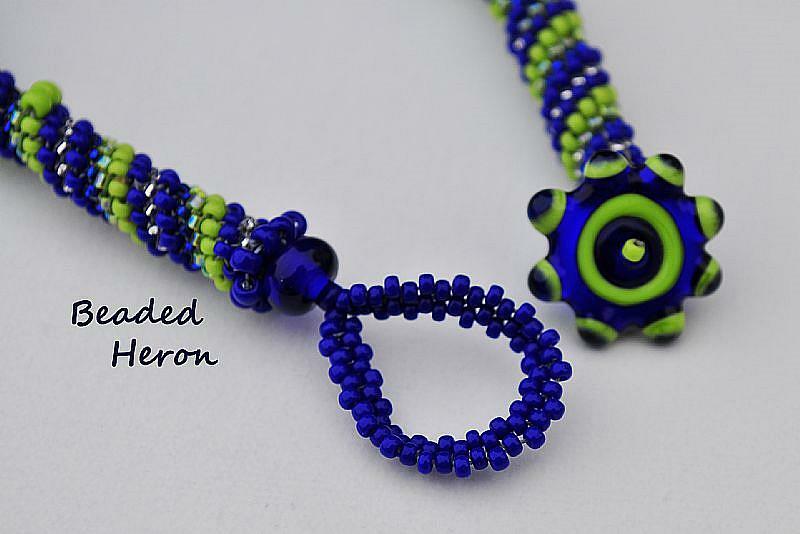 It was only natural then, that I would want to use some of my Aurora glass beads and incorporate them into a smashingly fun necklace to wear and celebrate this phenomenon. 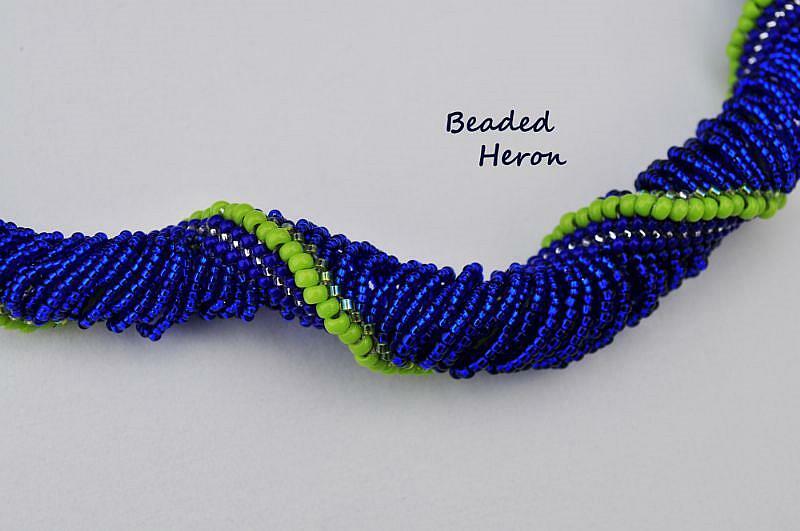 This necklace is 100% made my me with the exception of the tiny glass silver line cobalt blue seed beads and the thread I used to weave them. The necklace took around 40 hours to put together once I made the glass beads and set them in my kiln for a proper annealing bath over about 6 hours. If you have ever visited the arctic, or stood on the shores of Lake Superior and taken in the northern lights, what you would see against the ink blue sky might be flashes of bright green among the stars. Northern lights do also come in reds and yellows but the most common of them are green streaks dancing across the night sky. 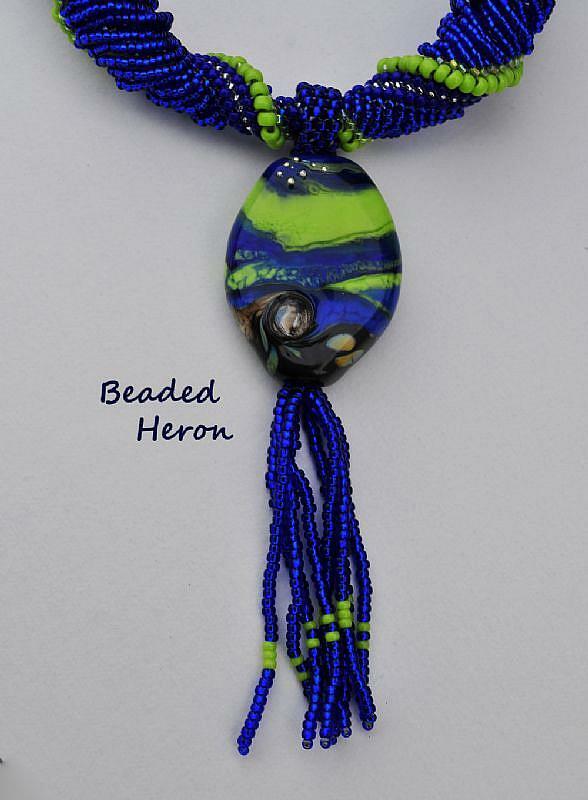 In constructing this necklace I used one of my own handmade lampwork glass beads, into which I also melted pure silver to add star interest, and I added a wave as to appear I was standing on shore of the world's greatest lake, Lake Superior. I then set out to make a beautiful graduated spiral necklace which changes widths throughout the whole piece which was very challenging as this is one piece construction. I also made a beautiful matching end spacer beads and the warring states style bead closure. With the points adding security to the beaded closure this piece could not possibly fall off while wearing. The fun dangles were added so they can dance as I move in this necklace just like the northern lights do in the night sky..